A nice summer cocktail, made with Pink Moscato! 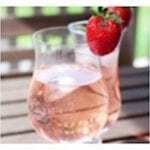 A mixture of Pink Moscato, Vanilla vodka and Strawberries, it’s great for your summer festivities! Shake Moscato & vanilla vodka with ice. Pour into your favorite cocktail glass & top with strawberry soda. For a slightly less sweet version, use one the following instead of strawberry soda!